Did you start our cornhusk doll project for St. Patrick’s Day? If you did and your doll has completely dried, you’re ready to create her hair, her hat and her basket of flowers. Read on to learn how. 1) The Hair: Her hair is made from braided wool roving. Cut a piece between 2 and 3 inches long. It stretches a bit. Tease the center open a little bit, then glue to the top of her head. Then, use a permanent marker–I prefer the Sharpie Fine Point–to draw simple eyes on her face. 2) The Hat: Make the hat from a piece of husk is about 2 inches by 3 inches. Fold back the brim of the hat while the husk is damp, hold each side in place with clothespins. Now, carefully bend the back of the hat, the unfolded side one edge over the other. Pin this in place until the husk begins to dry. Then add a little white glue, repin and allow to dry completely. Once the hat is dried, glue it onto her head. I use hot glue because I want to position it quickly and exactly. If your husk is still damp, hot glue will not work. 3) The Basket: The last thing to do is prepare a basket of something for her to hold. One of the dolls is holding a basket of some shamrock confetti that I found. The other doll is holding some fresh virburnum in her basket. I use viburnum because it has a greenish-white color, very nice for this doll and for St. Patrick’s Day. Remember: To complete this craft for each less money, check your local thrift store for materials you can make into a basket or a sweater with frayed ends you could repurpose for the doll’s hair. 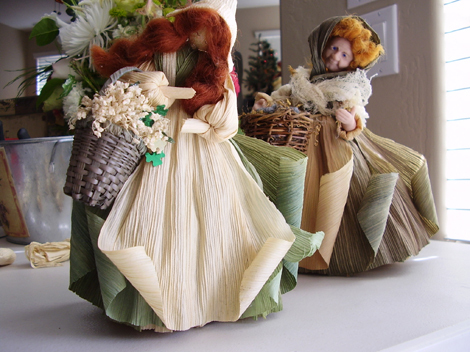 This very special Cornhusk Irish Maid is sure to be a welcome addition to your tablescape on St. Patrick’s Day! If you have any questions on how to construct her, feel free to contact the author and artist here. However you choose to spend St. Patrick’s Day, enjoy some Irish music, food, and drink. Slainte! This entry was posted in Decor Inspiration and tagged budget, craft, doll, Irish, project, St. Patrick's Day, tablescape by Flea Market Decor. Bookmark the permalink.